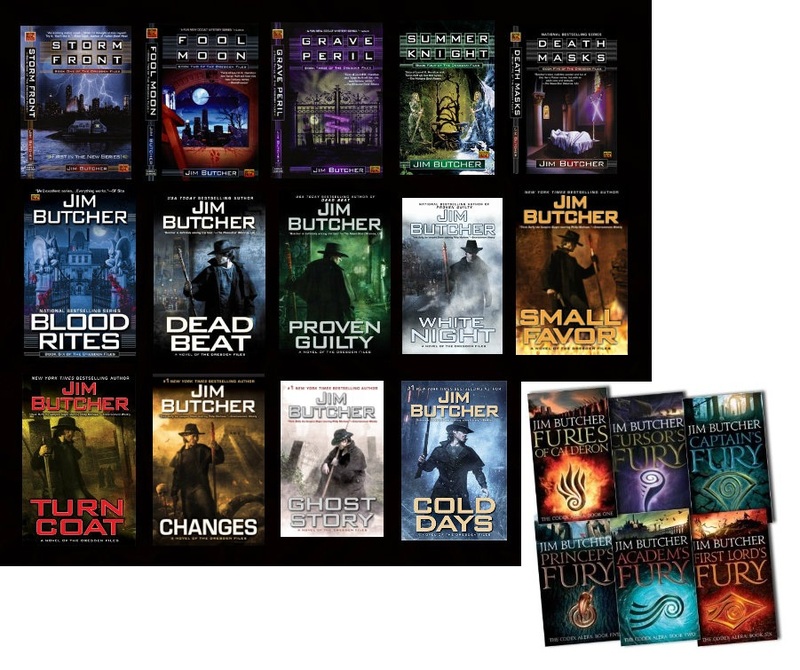 OK, so I've only read - listened to - the first four Dresden Files books. I listened to them on Audible and they were amazing, though that could easily be because James Marsters (Spike from Buffy, Brainiac from Smallville, you know who it is) was reading it. He just sounds perfect for the role. I have finished the Codex Alera books (barring any book he's released recently that I don't know about, but I'm fairly sure the series is over), and those ones I actually read. It took me about 3 years, but I read them. I started the first Codex Alera book back in 2009 when I went to Scotland for the day for an interview. I reach about 300 pages waiting for cabs and planes and waiting for my interview, but by the end of that day I was just absolutely sick of it. I didn't want to touch it anymore and didn't pick it up again until I started working again this time last year. On the journey to and from work, and in my lunch breaks, I finished that book and the five other novels in the series. I powered through it in a month, less than. There was one book that I read 1/3 of in a day, almost missing one of my trains. Codex Alera is the story of a young man without any powers in a world where everyone, even the weakest person, has powers. It's a story of a young man finding his place in the world and saving a lot of people along the way. The first two books are a little boring but the third and onwards are awesome. Set in a Romanic world where everyone (except Tavi) has control of elemental spirits called Furies. they can use these spirits to control all of the elements, but few people have a spirit from each element. Tavi, a young farm boy gets caught in a fury storm one night while looking for lost sheep and runs into an agent of the emperor. He and his whole family get caught up in wars and monsters across the lands of Alera leading to the shocking reality of who Tavi really is, but I won’t give that away. Fun fact; Jim Butcher wrote the Alera books when someone bet him that he couldn't write a story about Pokemon and the lost Roman legion and make it interesting. Conclusion; he both failed and succeeded. Succeeded; it’s an awesome set of books. Failed; I don't think you can remotely say that it's got anything to do with pokemon. The Dresden files are about Harry Copperfield Blackstone Dresden. A wizard in Chicago who advertises in the business section. He mostly specialises in murders, but he helps out with other things as well. 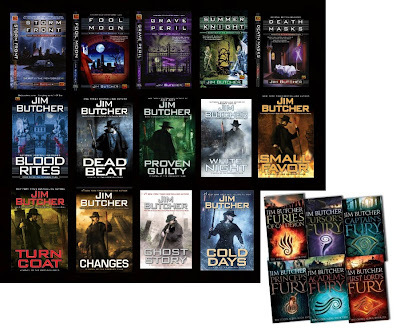 I like to describe the Dresden Files as 'Harry Potter, if Harry was a homicide cop' but since he doesn't' work specifically for the police in the books it’s a little inaccurate. The first book is your average detective story (but with magic). It's good, really good even, but they get great as you keep reading. The first one is a standalone book but the rest have continuing plots, in the background at least. Events unfolding that are related to previous books and future events. It's really cool and you have to pay attention. I consider myself good at figuring out plots but a lot of the time I've not managed to figure out what's going on. Sometimes I do, but I prefer not guessing. Anyway, they're both really good stories, read them... you know what'd be awesome? If I got published I could do give an away with each of the of 52s. P.S. I can't afford the lock pick gear so I'm learning sound editing.